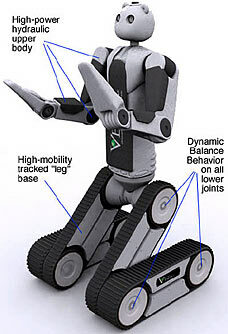 Daring battlefield rescues of wounded comrades may one day be a thing of the past as the US army is developing a robot that can recover injured or abducted soldiers. 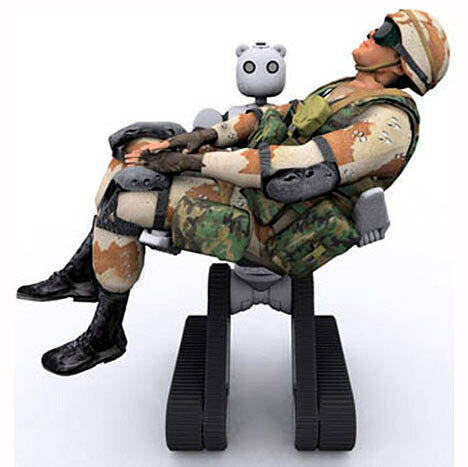 The remote-controlled Battlefield Extraction-Assist Robot (Bear) will be able to travel over rough terrain while carrying a casualty comfortably in its arms, New Scientist reports today. A prototype can already lift more than 135kg (300lb) with one arm and climb stairs holding a human-sized dummy. The robot - which has a rounded head with teddy bear-style ears and large eyes - can also carry a wounded soldier while kneeling or lying down, making covert rescues possible. Bear’s legs are fitted with tracks for rugged terrain and wheels for travelling over smooth surfaces. Computers linked to gyroscopes adjust the position of the machine’s lower body if it is about to fall over. It is anticipated that the robot will also be used by the military to carry heavy equipment. Bear is expected to be ready for field tests within five years. » Robots That Transform Into Shoes And Earphones!